Dizzy Gillespie: (1917-1993) was an American jazz trumpeter, bandleader, composer, and singer. In the 1940s Gillespie, with Charlie Parker, became a major figure in the development of bebop and modern jazz. He taught and influenced many other musicians, including trumpeters Miles Davis, Jon Faddis, Fats Navarro, Clifford Brown, Arturo Sandoval, Lee Morgan, Chuck Mangione, balladeer Johnny Hartman, and one of Gillespie's final pupils before his death, Robert Stewart (saxophonist). AllMusic's Scott Yanow wrote: "Dizzy Gillespie's contributions to jazz were huge. One of the greatest jazz trumpeters of all time, Gillespie was such a complex player that his contemporaries ended up being similar to those of Miles Davis and Fats Navarro instead, and it was not until Jon Faddis's emergence in the 1970s that Dizzy's style was successfully recreated. Arguably Gillespie is remembered, by both critics and fans alike, as one of the greatest jazz trumpeters of all time". John Birks “Dizzy” Gillespie, along with Charlie Parker, ushered in the era of Bebop in the American jazz tradition. He was born Cheraw, South Carolina, and was the youngest of nine children. He began playing piano at the age of four and received a music scholarship to the Laurinburg Institute in North Carolina. 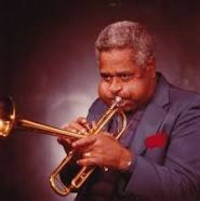 Most noted for his trademark “swollen cheeks,” Gillespie admitted to copying the style of trumpeter Roy Eldridge early in his career. He replaced Eldridge in the Teddy Hill Band after Eldridge’s departure. He eventually began experimenting and creating his own style, which would eventually come to the attention of Mario Bauza, the godfather of Afro-Cuban jazz who was then a member of the Cap Calloway Orchestra. Joining Calloway in 1939, Gillispie was fired after two years when he cut a portion of Calloway’s buttocks with a knife after Calloway accused him of throwing spitballs (the two men later became lifelong friends and often retold this story with great relish until both of their deaths). Although noted for his on and off-stage clowning, Gillespie endured as one of the founding fathers of the Afro-Cuban and/or Latin jazz tradition. Influenced by Bauza, known as Gillespie’s musical father, he was able to fuse Afro-American jazz and Afro-Cuban rhythms to form a burgeoning Cubop sound. Always a musical ambassador, he toured Africa, the Middle East, and Latin America under the sponsorship of the US State Department. Quite often he returned, not only with fresh musical ideas, but with musicians who would eventually go on to achieve world recognition. Among his proteges and collaborators are Chano Pozo, the great Afro-Cuban percussionist; Danilo perez, a master pianist and composer originally from Panama; Arturo Sandoval, trumpeter, composer and music educator originally from Cuba; Mongo Santamaria, an Afro-Cuban conguero, bongeuro and composer; David Sanchez, saxophonist and composer; Chucho Valdes, an Afro-Cuban virtuoso pianist and composer; and Bobby Sanabria, a Bronx, NY-born Nuyorican percussionist, composer, educator, bandleader, and expert in the Afro-Cuban musical tradition. Indeed, many Latin jazz classics such as “Manteca,” “A Night in Tunisia,” and “Guachi Guaro [Soul Sauce]” were composed by Gillespie and his musical collaborators. With a strong sense of pride in his Afro-American heritage, he left a legacy of musical excellence that embraced and fused all musical forms, but particularly those forms with roots deep in Africa such as the music of Cuba, other Latin American countries, and the Caribbean. Additionally, he left a legacy of goodwill and good humor that infused jazz musicians and fans throughout the world with the genuine sense of jazz’s ability to transcend national and ethnic boundaries. For this reason, Gillespie was and is an international treasure.